The 40th Anniversary of the first Sydney Gay and Lesbian Parade held on 3rd March 2018 attracted the largest contingent of 78ers in many years. Around 250 78ers from across Australia and overseas marched up Oxford St to loud cheers and applause from the massive crowd. At Taylor Square a group of 78ers punched out a dance routine to “I Am What I Am” before continuing into Flinders St.
First Mardi Gras was able to bring low income 78ers from interstate to participate through fund raising and a grant from Sydney Gay and Lesbian Mardi Gras. On the night before the 40th Anniversary Mardi Gras Parade, First Mardi Gras hosted a Cocktail Party for 78ers and their guests. This fully catered function was held at the Australian Museum, with the venue offering sweeping city-scape views. Around 220 people attended the function with guests fully embracing the “touch of pizazz” dress code. There was plenty of time for guests to mingle with friends and acquaintances, some of whom they had not seen in decades. A highlight of the night was the sensational performance by well-known entertainer Paul Capsis, who donated his time to the function. First Mardi Gras curated and staged a celebration of 40 years of queer art in Australia showcasing works by over 20 LGBTQI artists who have created diverse, thought provoking, stylistically varied works that subversively engage with the politics of identity, community and activism. The works ranged across painting, drawing, prints, posters, photography and multimedia. The exhibition highlighted the role of queer artists in changing societal attitudes, subverting the politics around LGBTIQ and contributing to queer culture. Art works featured include those by renowned photographers such as William Yang and C. Moore Hardy and contemporary artists such as Lisa Anderson, Kim Leutwyler and Tina Fiveash. Works by David McDiarmid and Frances Phoenix, who contributed to the first Mardi Gras exhibition at Watters Gallery in Sydney in 1978 were on display as were as those bylesser-known, later generations of queer artists. 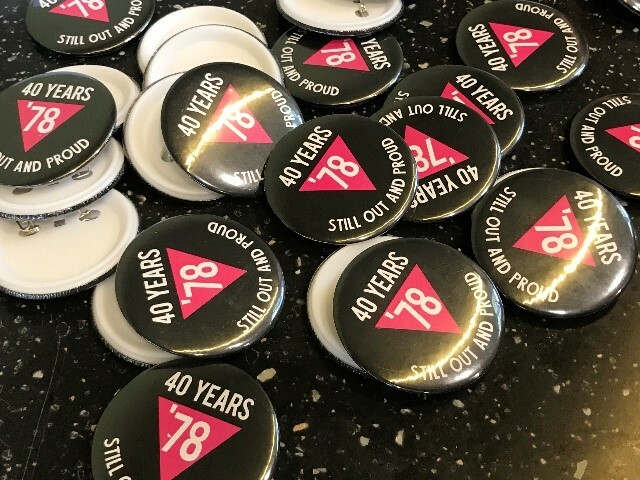 The exhibition which was held between 21st February and 8th March 2018 also included rarely seen photographs, posters and imagery from the 1970s and 1980s reflecting the fight for LGBTIQ rights, including the first Mardi Gras. The 78ers stall at Fair Day held on Sunday 18th February attracted a large number of visitors throughout the day. Short interviews with 78ers were screened and a limited edition 40th Anniversary badge was on sale. A number of media interviews were also conducted at the stall. Was the pain worth the gain? On Saturday 17th February, 2018 First Mardi Gras held a public forum, In conversation with 78ers: Was the pain worth the gain?, at the East Sydney Community and Arts Centre, Darlinghurst. Several 78ers spoke of their experiences with some of the main issues and challenges pre-occupying the GLBTIQ movement and its various communities during the 70’s, 80’s and 90’s, the broader social and political context of the periods in Australia and internationally and the diversity of gay, lesbian and queer organisations that emerged, and their relationship to each other. In the lead up to the event, SBS supported 78ers with an article about the origins of Mardi Gras and promoting the public forum event. That article can be read on the SBS website by clicking here, or a copy downloaded by clicking here.